Discussion in 'Mac OS X Lion (10.7)' started by CarlHeanerd, Apr 30, 2011. The interface has been re-skinned. Before, it used to look like Snow Leopard's. I wish Apple would revert the green timeline to the old transparent one. I know the green has been here since Lion's first build, but still. It's pretty ugly. Yeah, the stars makes a good desktop but the last Time Machine background made more sense. So, what ever happened to the local snapshots feature? It still exists, but I don't know if there is a preference pane for it. I don't know how to use it. 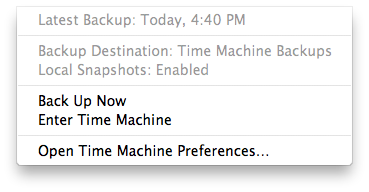 In the Time Machine system preferences you used to be able to click on Options and enable or disable the snapshots. There was a bug where it was eating disk space. Mine was off, now it is on, and they removed the GUI to turn it on or off. I noticed I can't enter the Local Snapshots feature. I don't have a Time Machine back up enabled for my Lion partition but before build 11A444d, I can enter Time Machine and see my snapshots. Now, every time I try to enter Time Machine, I get this. (See Screen Shot). It does say "Local Snapshots: Enabled", just can't access them. *sighs*... time to file another bug report.